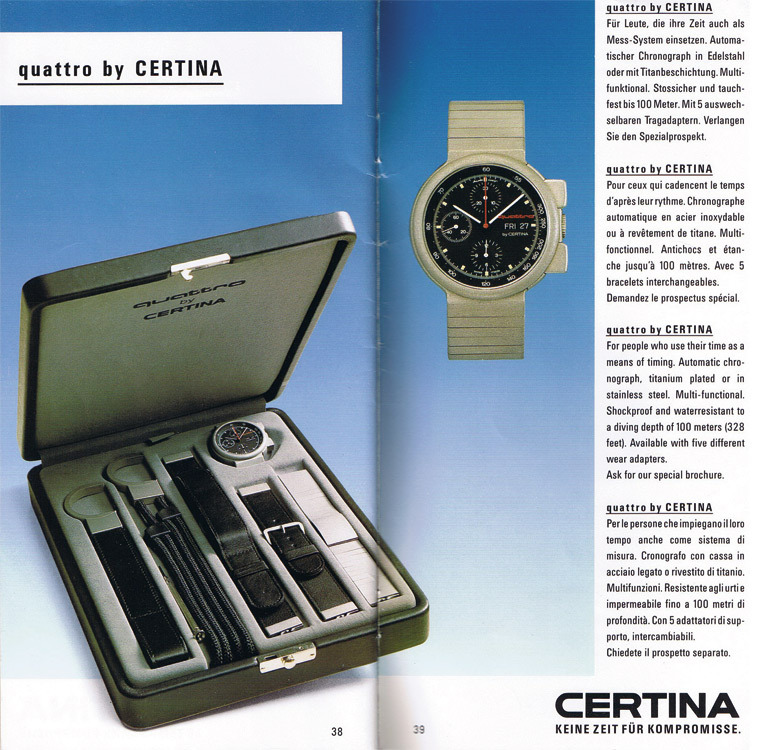 The Audi Design Quattro watch by Certina came on the market in 1983 and was a cooperation between Audi and Certina on the occasion of the founding of the company “quattro GmbH” that same year. The model was available only in Germany and was probably made available at a preferential price, to purchasers of an Audi Quattro. It is possible that the watch edition was limited to 1,000 units, but I have not been able to verify it. 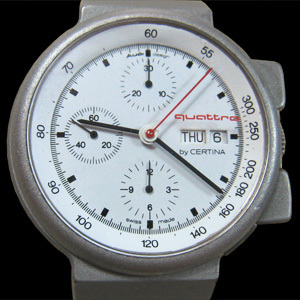 The design of the watch came from Audi Design. 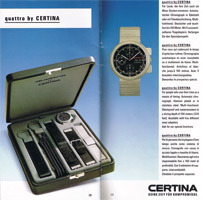 The watch was delivered as a set in a black leather box with a grey inlay. With the so-called “das Zeit-System” (The Time System) set, the watch could be attached to various bracelets or to a cord, and thus worn on one’s wrist or hung around one’s neck. In addition to the two leather straps and a matching metal bracelet, a cord and a leather strap were also supplied (see picture on the left). 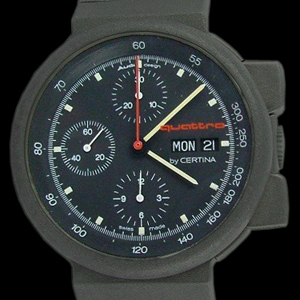 The watchcase was available in a black-titanium-carbide-coated finish or in stainless steel. 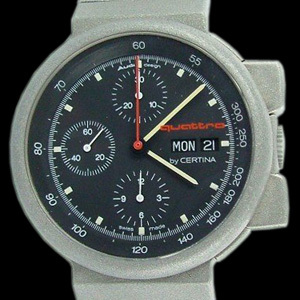 There was a version with a black dial and a version with a white dial available. It appears the black dial may have been more common. 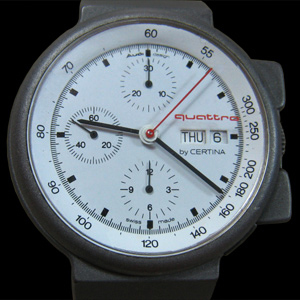 The red “quattro” writing is printed to the inner side of the sapphire glass. The design of the chrono push-buttons is massive and, at a first glance, they look like a crown guard. Inside the watch the well-known Valjoux 7750 chronograph movement works with an unsigned rotor. You can find more information and pictures about the “Zeit-System” in this manual.